As a lifter, I’ve been hip thrusting now for 9 and a half years, and I’ve been prescribing them to clients as a personal trainer for the same amount of time. I’m not sure if I’ve ever told this story on my blog, so here’s how the idea for hip thrusts came to mind. I was hanging out with my now ex-girlfriend (poor Jeanne), watching UFC fights. It was Tito Ortiz versus Ken Shamrock, and though I didn’t really care who won, I didn’t want the fight to end quickly. Tito full-mounted Ken, and I was hoping that Ken would buck him off. Having spent most of my life wrestling with my twin brother, and having done a couple of years of MMA training, I was no stranger to escaping the full-mount position. 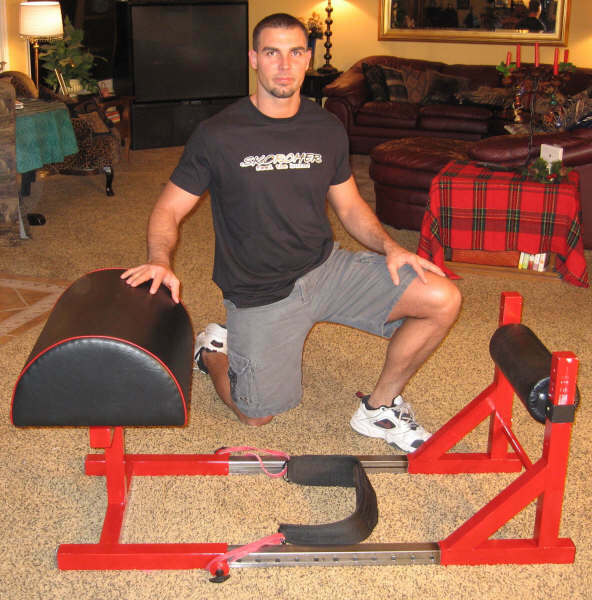 There are several ways to escape, but the more explosive your “hip bump,” the better off you are (interestingly, I just found THIS article about escaping the full mount and it mentioned the hip thrust). But Ken didn’t bother trying; he just laid there getting pummeled. As a CSCS, I immediately started pondering ways to train and strengthen the bridging pattern. In addition to wanting to add extra loading, I also wanted to find a way to add extra ROM. Several ideas came to mind. I quickly dismissed the notion of conducting “partner-assisted” training, as it’s not exactly “socially acceptable” to approach another man at the gym and ask, “Hey bro, will you straddle me while I thrust you up and down for 20 reps?” Maybe this is okay with your significant other behind closed doors, but not in the weight-room – nobody wants to see that! Another idea came to mind and I ventured into my garage, where I had a stellar garage gym. 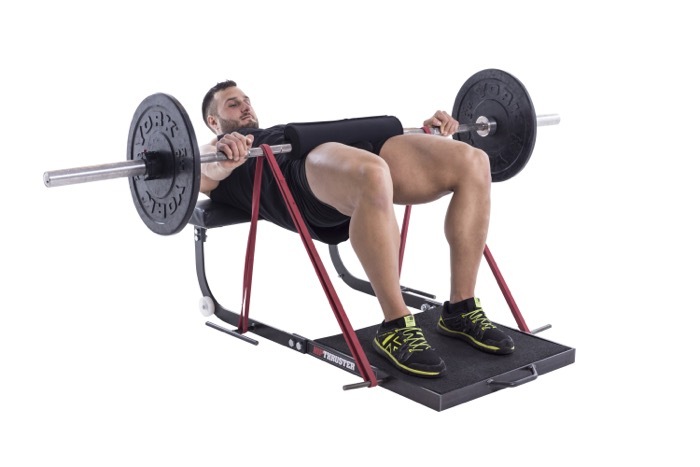 I decided that I would drape my back against a glute-ham developer and place my feet against a reverse hyper, all while having a weighted dip-belt suspended from the hips. The extra height would be needed to allow the weight to sink down beneath the hips. I asked my girlfriend at the time to come outside and help me move the glute ham developer and reverse hyper, and she was thoroughly annoyed. In fact, she quickly marched inside because she was enjoying her Tuesday night on the couch and couldn’t understand why this couldn’t wait until the following day, thus leaving me all by myself to manipulate the heavy equipment. I persisted and within 10 minutes, there I was, back against the glute-ham developer, feet against the reverse hyper, with 4 plates (180 pounds) suspended via a dip belt underneath my hips. I started the set, and after 10 reps my glutes felt a burn I’d always sought in the weightroom but hadn’t ever been able to achieve. The smile on my face quickly eroded at 15 reps when I nearly pulled my left glute. At this point forward, I knew that I had to teach my fellow brethren all about this magnificent glute exercise as to that day, I’d never felt anything work my glutes before to that extent. I started prescribing it to clients and it was an instant favorite. I can’t tell you how many times I was asked, “Can we do that special glute exercise today?” At this point I stuck to high rep bilateral hip thrusts, moderate rep single leg hip thrusts, and dumbbell hip thrusts with 25-100 lbs (but I’d use two 100-lb dumbbells and position them pointing upwards on my hips, as I was the strongest out of my clients and training partners). I then decided to make a machine that would allow for convenient hip thrusting. Within two months, I had a logo, prototype, and completed patent application. Within five months, I had a comprehensive EMG study conducted by a reputable biomechanics lab showing that hip thrusts greatly outperformed squats and deadlifts in gluteus maximus activity and that single leg hip thrusts greatly outperformed lunges in gluteus maximus activity (click on this link to access that report: Hip Thrust Report 2007). The first prototype was a good start, but it didn’t adjust well, the foot padding eroded over time, and the band tension was tricky to get right. My next prototypes were much better, but they weighed a ton and costed a lot of money to manufacture. The band hip thrust off of “The Skorcher” was incredible. However, using a barbell was only convenient if you had spotters. Getting into position was highly challenging if you were training alone. Case in point, see below. To make a long story short, Skorcher didn’t pan out, I learned how to conduct EMG on my own because I wanted to conduct more experiments (especially with heavier loading), I realized that one could hip thrust off of a standard bench (at that point in time, my clients, training partners, and I always used the Skorcher and never considered using a bench), I wrote an eBook, started up a blog, wrote an article for TNation (Dispelling the Glute Myth), and taught the world to hip thrust with a barbell and a bench. Who is The Founder of the Barbell Hip Thrust? Now, I’m certain that there were plenty of coaches who thought up hip thrust variations before me. Being an aficionado of the history of physical culture, I’m interested in finding coaches, lifters, and scientists who were recommending hip thrust variations before me. I’ve seen variations from Yuri Verkhoshansky, Mel Siff, and Tudor Bompa (I even re-drew their images and posted them on my blog three-and-a-half years ago HERE). I’ve heard plenty of anecdotes from athletes whose coaches prescribed them decades ago. And I’ve seen pictures of lifters either elevating their backs onto something or putting extra loading on their hips while bridging. But I’ve never seen any pictures or videos of heavy barbell hip thrusts “pre-Bret Contreras era”; if I did, I would love to give credit where credit is due. At any rate, here is the evolution of modern bridging and thrusting, post Youtube era. In the beginning, there were bodyweight glute bridges, single leg glute bridges, feet-elevated hip thrusts, and single-leg foot-elevated hip thrusts. There were even shoulder elevated hip thrusts on stability balls. For some reason, people didn’t “push the limits” with bridging patterns like they did with other patterns such as squatting, bending, lunging, towing, pressing, pulling, and carrying. When I came onto the scene and started recommending more challenging variations, it sparked considerable innovation within the strength & conditioning industry. We not only pushed the limits with barbell loading, but strength coaches and personal trainers started thinking up nifty, useful variations on a weekly basis. As you can see, the glute bridge has come a long way! The starting point is still the bodyweight bridge – either on the floor, with feet elevated, or with shoulders elevated. But the ending point involves crazy one legged variations and bilateral thrusting with several hundred pounds! As a matter of fact, one woman has now hip thrusted 500 lbs and a few men have hip thrusted over 700 lbs! Keep Spreading the Glute Gospel! Bret, I would love to make the hip thrust a part of my training routine but apart from lower back issues it gives me knee pain in the aftermath (more precisely its my patella tendon that hurts, even with bodyweight only). I even get some minor problems in my knees with the glute bridge! I learned from your blog about avoiding lower back pain but what about my knees? Have you ever heard about that? Could it be because I have long limbs which seems to be a disadvantage for weight lifting? Are there some modifications or should I just exclude the hip-thrust? Iris, I’d love to see a vid as I bet you’re hyperextending a bit at the lumbar spine. As for knees, yes, I have heard of this. I’ve probably had 3 people approach me about this over the past couple years, but I experienced it myself around a year and a half ago when I did hip thrust isoholds for three weeks straight with 405-495 lbs. My quadriceps tendons started hurting, and I suspect that this has to do with the tremendous quadriceps contraction that accompanies hip thrusting. Most people don’t know this, but you get very high levels of quad contraction when doing shoulder elevated hip thrusts. 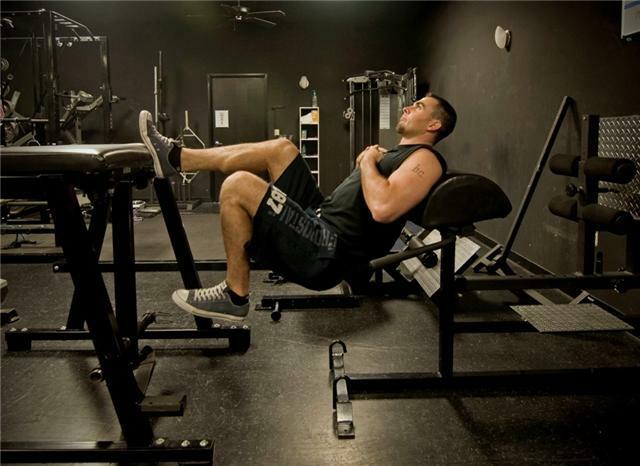 My advice – try with a lower bench (aerobics step with 4 risers maybe), place the feet out slightly more, dorsiflex the ankles, and PPT the pelvis a bit as you rise. Or you could try the bb glute bridge, or the feet elevated hip thrust for high reps. You can also try these for a while and then go back to regular hip thrusts and see if it helps. Best of luck! Mine went away after stopping the isoholds…took a few weeks to subside. Forgot to mention…is it patella tendon or quadriceps tendon? Important to know the difference. Thank you, Bret, I appreciate your advice very much! As for the lower back, I think I learned enough to solve the issue! As for the knees: Yes, it is the patelly tendon indeed which is definitely a weak spot in my body (as well as my achilles tendons while my joints are usually fine, it seems I have tendons that are injury-prone). I definitely will try the feet elavated variant. I guess I should aim at avoiding a 90 degree angle in my knees? And I wish to add that it is great that you answer the comments on your blog and give personal advice, you are definitely one of the nicest and helpful persons in the fitness blog sphere! Dear Bret, I actually have the same problem as Iris, my knees hurt when I do the barbell hip trust. I started doing it 1 and a half month ago, and started using just 10 kg last week but my knees started hurting when I added weight. Do you think it can be a form issue? catarina, see advice above. My fiance Diana felt hip thrusts mostly in her quads, but after two months of feet elevated hip thrusts, she could finally feel regular hip thrusts in her glutes and not so much in her quads. This would lessen the quad contraction and lessen the tension on the quadriceps tendon. Best of luck! Thanks a lot for the advice and for taking the time to write to us. I will do as advised! Very cool Corey!!! Thanks man. Fantastic post Bret and congratulations on a journey that’s impacted so many lives in such a positive way! Gotta say, Ben Bruno has some unreal variations, especially that pull-up inverted row hip thrust combo with chains, holy heck! … and I’m definitely going to try the band resisted one tomorrow! Love all the clips, thanks! Thanks Maria, so glad you liked it! My goal when I started up this blog was to equip thousands of “glute-guys” all over the world in every major city haha! Glad you paid attention to my advice and benefited from this blog! Great compilation of videos, and as usual a great article. I’ve been using barbell hip thrusts and single leg thrusts for a while now thanks to your site/research/everything here. I was approached by a fellow PT whilst I was performing single leg thrusts and she loved the movement and wanted to know more about it, so she could introduce it to some of her own clients. So obviously I directed her here. Some of my own clients are now performing them and see decent results. Sorry Nick, didn’t mean to offend. Hahahaha! That just cracked me up royally. Good stuff! My husband thinks I’m obsessed with Bret. Since I travel a LOT, I bring my crossfit bands with me where ever I go. I have used the standing hip thrusts by winding them around anything I could find. Was in a hotel in Brazil doing them only to receive headshakes saying NO until I turned around, and they went to YES!!! Thanks Bret, you’re a gluteus godsend! Hey Bret. Do you think that Ben Bruno’s pullup inverted row single leg hip thruster would activate more glute than the bottoms up single leg hip thrust? or would the glute activation be the same, while the upper body takes care of the rest of the lift? I ask because I’m using just bodyweight for my strength training, and I’m looking for the best glute/hamstring exercise to build up to. BTW I’ve got your Bodyweight Strength Training Anatomy book, and found it very useful. When it came in the mail I read it cover to cover in a couple of hours, couldn’t put it down. Wow, wow, wow! Thanks for SO many resources! Love the dude sporting the cowboy boots!